Bungy jumping in New Zealand is a ‘must-do’ experience for all adventure lovers and thrill seekers. With New Zealand being the birthplace and home of bungy jumping – what better place to dial up the adrenaline? Rotorua’s Velocity Valley Adventure Park takes adrenaline and speed to a whole new level, offering all of New Zealand’s favourite adventure experiences in one place. All six rides and activities reflect Kiwi culture, innovation and ingenuity – it’s the perfect mix of thrills, fun and great value. Bungy jumping was invented by New Zealander, A. J. Hackett. After developing the world’s first bungy cord, in conjunction with scientists (phew! ), he tested it out by jumping off a number of bridges in New Zealand, before travelling to France. Whilst visiting Paris, A. J. Hackett snuck up the Eiffel Tower at night time for the ultimate test. He was arrested for taking the Paris plunge without permission, but the rest is history – bungy jumping is now one of the world’s most popular adventure activities. So, if you’re keen to try a bungy jump, but don’t fancy the more extreme (or expensive) experiences, you’ll love Rotorua’s Velocity Valley. It’s a great place to experience your first jump. 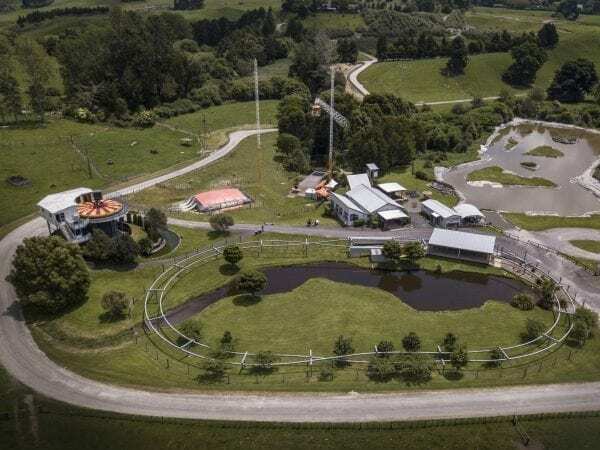 The adventure park has a range of clever Kiwi inventions: jet boats, a giant swing, Shweeb racing – which involves racing your mates by pedaling in suspended pods – it’s so much fun. There’s also a wind tunnel where you can soar like a bird, or if mountain biking is your thing, there’s a giant air-bag where you can try out jumps and slopestyle tricks and land softly! And with multi-ride pricing packages for individuals and families, you can fill up your happy tank without breaking the bank. Situated in beautiful farmland, Rotorua’s ‘terminal velocity’ bungy experience is New Zealand’s most popular introductory bungy jump. At 43 metres high, there are great views from the top and you can choose to jump solo or tandem with a friend. If you’re scared at the thought, try a tandem jump with a mate. It’s double the fun and you can deafen them with your screams for added amusement. And don’t forget the bragging rights – there’s no shortage of opportunity to earn them! 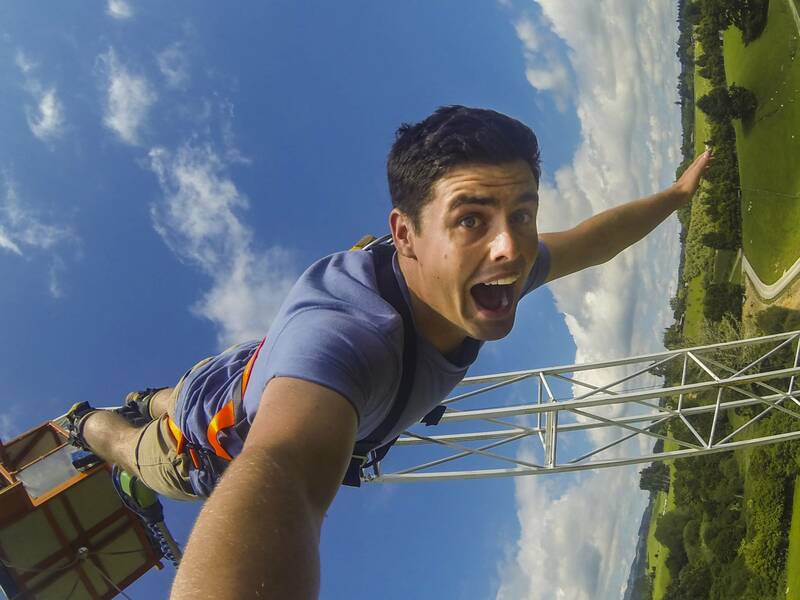 Showing off on social media is made easy too – your Rotorua bungy jump video and photos can be purchased at reception. It’s an action-packed, family-friendly day out and well set up for rain or shine. The team that run the park are a friendly, fun-loving bunch and they’ll ensure you have an amazing and safe experience. Kids over 10 years of age can bungy jump, as long as they weigh at least 35kgs (77Ibs). There are so many awesome bungy jumping locations throughout New Zealand. 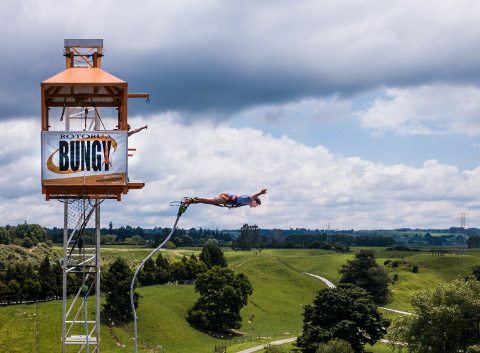 Some of the best bungy jumps on the North Island include the Velocity Valley Bungy in Rotorua – as mentioned above, the Auckland Harbour Bridge – with spectacular panoramic views of the city, marina and harbour. 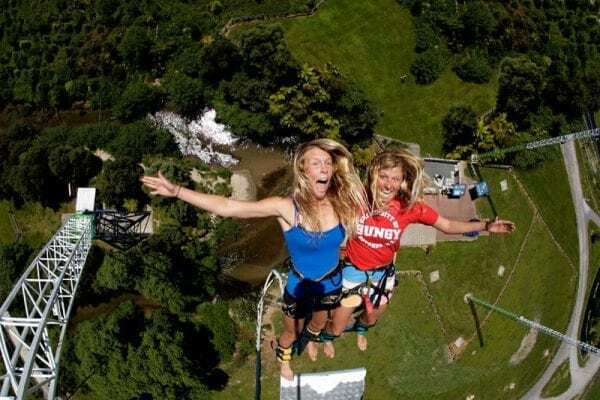 And Taupo, where you can bungy jump from a cantilever platform perched on the cliff-tops overlooking the Waikato River. In the South Island, some of the best bungy jumps are in and around Queenstown. There’s the first ever commercial bungy jump, set up by A.J. Hackett, at the Kawarau Bridge – overlooking the Kawarau Gorge. There’s also the Ledge Bungy, with incredible views over Queenstown, Lake Wakatipu and the Southern Alps. The Ledge Bungy is accessible by cable car and jump-able at night time. If you’re looking to nudge up the fear factor, the Nevis Bungy is big and beautiful. Accessible by 4×4 and cable car, you jump from a suspended pod that hangs 134 metres over a canyon on wires. It’s the third highest bungy in the world – why wouldn’t you?